Joe Blades has built a solid reputation for writing adventurous and consistent poetry that explores casual perception with deliberate attention to detail, resulting in a lucid and acute artistry. A journey taking him into the world, perception by perception, Blades assembles the debris and fragments of experience, the materiality of language, from what he sees, he hears, he thinks and he feels. 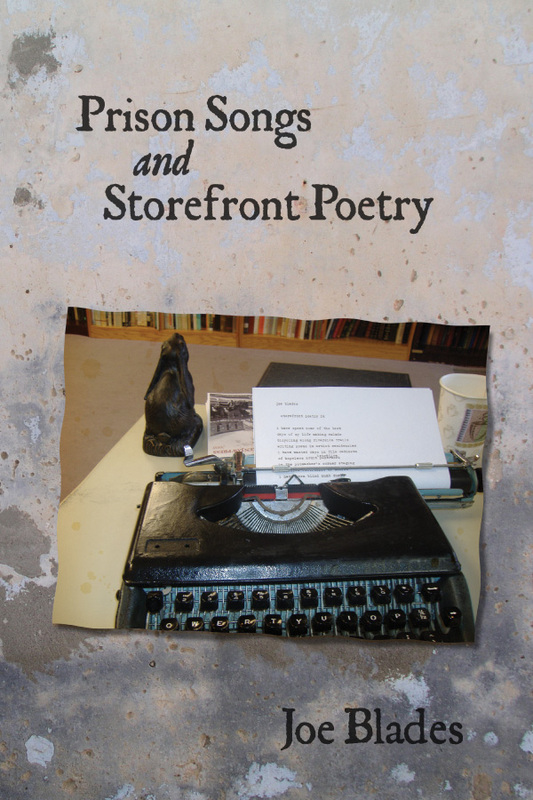 In Prison Songs and Storefront Poetry exploratory poems are rendered with Zen-like simplicity and calligraphic precision, from the palpability and velocity–sensitivity of a typewriter keyboard. The structured discipline of using a typewriter creates a spatial immediacy and also dictates the form of the poem, as the space between the words, the shape of the letters, and the pressure of the hand, all become the poem. Concisely focused on the immediate moment, the quick shifts of attention, the motion of these acts of perception constructs an architectural logic within the poetry. Joe Blades has created a sculptural grammar out of the spatial arrangements of words through the process of writing them. Mallarmé remarked that the perfect poem was a blank page. In Prison Songs and Storefront Poetry, Blades has discovered the expansive potential of the blank page, rendering in intricate detail the physicality of words and gathering, with the grace of the eye, the harvest of the moment. One enters a Joe poem as one might enter Joe’s home. You can walk around inside these poems and go where your curiosity takes you. They read like ‘notes to self ’, they read like thoughts on the fly, they read like voices whispering in dusk light. One doesn’t even realize right away how open, how generous these poems are. Joe Blades lives in Fredericton, New Brunswick. On the editorial board of revue ellipse mag, he is President of the League of Canadian Poets, producer–host of the Ashes, Paper & Beans radio program, and founding publisher of the independent 25-year-old Broken Jaw Press. The author of seven poetry books, including Cover Makes a Set (1990), River Suite (1998), from the book that doesn’t close (2008) and the forthcoming Casemate Poems (Collected), two of his books were translated and published in Serbian editions in 2005, and several other book translations are in the works.